While we prefer the high-tech approach to bicycle touring, others still prefer to take off for parts unknown with just a compass, map and a wool cycling jersey. 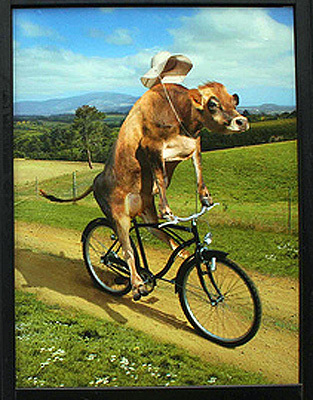 For those who insist on cycling without a GPS (and 11 pounds of batteries), we have great new research to report: cows point north. Researchers scoured Google Earth for images of cows standing around being cows. After looking at 8,510 cattle in 308 pastures around the world, they concluded that cows do indeed tend to align themselves north/south. Big-brained scientists say it is because of the the Earth’s magnetic field and that deer display the same tendencies. When I was a Boy Scout, we learned all about moss growing on the north side of trees but science hadn’t progressed far enough to know about cows. This could save lives! Unless, of course, you live in South Florida. We aren’t known for having a preponderance of cows or a lot of moss. If you bike far enough in any direction, you’ll come across water and clues as to where you are. South: If you hit water and find Cubans or Hatians crawling onto the beach, you have found South. East: If you hit water after having evaded a rent-a-cop security guard and are standing in the shade of a 20-story condominium, you have found East. West: If you hit water, find no one under the age of 70 and there is no nightlife but plenty of early-bird dinners, you’re on West’s doorstep. North: If you never hit water, you went North. If you have gone more than 180 miles without hitting a large body of water, stop every 20 miles and order grits. When you get to the first place that says, “What’s grits?” then you know that you’re heading north. I dunno. The cows I see on my rides usually point themselves at me until I get my camera out, then they point away. It could be the distortion in the magnetic field that my camera and I cause. 2. I find it wickedly funny that you can do so much product placement in a piece about cows pointing north! You go, guy! Orlando isn’t in South Florida. I stand by my statement that South Florida isn’t know for its cows. Welllll… might not be *known* for its cows, yes. Historically, Florida’s cattle land went as far south as Lake Okeechobee, which is the northern border of South Florida. I vaguely remember driving by fields used by McArthur Dairy in West Palm in the 70s, but all that seems to have been pushed west of Indiantown since then. I mourn. I mourn for the invisible magnetic cows of the Treasure Coast. Boynton Beach was once the dairy capital of South Florida. There were huge dairys located along Congress Avenue, Lawrence Road and Military Trail. They were all closed by the lats 1970s. There are about 8 cows left on Boynton Beach Blvd and Knuth Road just west of Congress, left there to preserve the agriculture zoning and save taxes. You can visit and bring them treats. Grant, indeed you are right. This used to be cattle country. You can still see a fair number of them if you take 98 out of Okeechobee headed to Sebring. I remember starting a story about the Adams Ranch outside of Ft. Pierce in the middle 70s. We were out in the boonies when I heard a lot of heavy equipment starting up. “What’s that? I asked. “Pt. St. Lucie coming through,” was the rancher’s answer. I handed the project off to one of my photographer’s, Jon Kral, who turned it into a book. They’re in LaBelle, too, where my aunt Mollie and her husband lived for a time and ranched; and all points north of there in the center of the state, particularly. Around West Palm area there were several dairies: Smith, Davis (I think? ), MacArthur, and off Okeechobee at the end of Military (Okee became a dirt road after that) my near-family of Jeff Goolsby had a dairy…they subsequently split it up, and some went to west Hollywood, some went to Okeechobee — which is even today split between dairy and cattle ranches. Florida’s big in dairy cows, too, incidentally, but its ranking in feeder cattle make it formidable in overall cow-counts. 2nd largest cattle ranchers in the state, by the way: Seminoles. As for progress: The Adams Ranch is now one of the few “natural” beef producers in the state, still owned by the Adams family. And Cliff Burg, of Burg and Divosta home builders, has cattle on his Sunlight Ranch off 76 west in Stuart — which will soon have several polo fields and a massive equestrian center open to the public. The cows, you see, offer it an ag tax advantage. The horses do not — they aren’t income-producing.